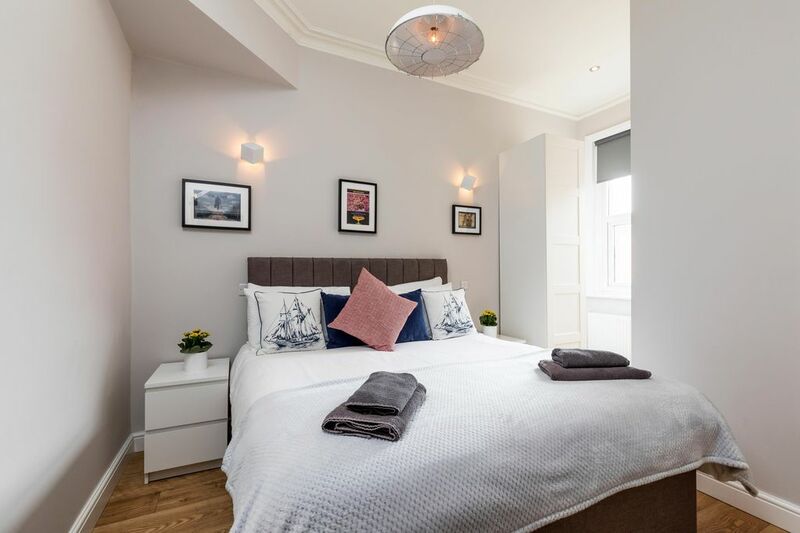 A first floor 2 bedroom suite with brand new decor and furnishings throughout (named after the actor Peter Sellers who was born in Southsea). The Sellers suite has a clean, modern design with a nautical theme. There is a bespoke, wooden, breakfast bar with an inlaid rope design and matching shelves in the kitchen area as well as 6 stools to accommodate the whole family. This suite is most suitable for 4 adults or families with up to 6 people (with 2 people sharing a double sofa bed). Bedroom 1 has a king size, hotel standard bed with pocket sprung mattress, 2 bedside tables, 2 wall mounted reading lamps and a free standing wardrobe. There is a brand new en suite shower room with a chrome head and hose shower which is accessed from bedroom 1. Bedroom 2 has a double, hotel standard bed with pocket sprung mattress, 2 bed side tables and 2 reading lamps. This bedroom is quite small and ideally suited for children aged 4-12 (although it can accommodate 2 adults as long as it is appreciated in advance that there is only enough space for the bed and bedside tables and clothes storage facilities are within bedroom one (as well as access to the shower room). There is also a comfortable double sofa bed in the lounge area. The suite is fully fitted with high speed wifi, 40 inch flatscreen smart TV’s (including Netflix and BBC and ITV iplayer). All of the furnishings and decor are brand new and the Sellers suite has a warm family feel, with touches of quirky nautical furnishings and decor. Guests here should feel at home. This was a perfect spot for the Portsmouth stop on our vacation. Bell was so very accommodating for our checkin and met us there at the agreed time. I have read other reviews about the common areas of the building and yes, it is a bit rough around the edges, however, the apartment has clearly, recently been updated. The bathroom was modern and clean and had a great supply of soaps, lotions and shampoos (a real treat). The bedroom was updated, with a comfy bed and had lots of storage and space for our luggage and the kitchen was well stocked. There was even a supply of milk, bread and a bottle of wine upon arrival. Bell was also able to provide us with parking passes (￡5/day) which was incredibly useful and inexpensive. The living room was probably the space that was the least appealing (could have used a carpet to warm it up) as the sofa was lightly stained, the TV on the wall "flopped" down so we had to use the fan to prop it up to see it and only 1 of 3 lights above the island worked. For us these were minor inconveniences as we were not in the apartment a lot but fixing them would make a difference. Additionally, Bell sent us information regarding restaurants in the area and food stores, however, it would have been easier if it was in a book in the apartment for reference (this did not prevent us from doing anything). We did enjoy our stay and would probably stay here again given the great location.